Dig around in one of the small clusters of businesses at Gold Creek Village and you’ll stumble upon Armadillos Cafe. Read any literature and it will tell you Gold Creek Village is for Canberrans and visitors alike. I visit with my sister who has lived in Canberra for 35 years, and I think she may have visited once – maybe. It’s a strange place. I get the feeling that once upon a time it had high hopes, but now feels forgotten. The day I visit Armadillos Cafe offers a choice of plain, ginger, or date scones. I try a plain and a ginger scone for something different, and to be honest, can’t tell the difference. Either the ginger is very subtle, or the heat from the microwave has neutralised any flavour, but they are definitely made on the premises as opposed to bought-in. The rich and fruity raspberry jam pairs well with the double thick cream. Once done sconing it up, there are enough shops to meander through, more cafes to try, as well as the National Dinosaur Museum, Canberra Walk In Aviary, and Canberra Reptile Zoo. Tea: An unusual array of T2 loose-leaf teas served in a small teapot. Teetering on the ACT/NSW border, the historic village of Hall remains hidden away from the city lights. Proclaimed a village in 1882, settlers had moved in long before then, stablishing a store, post office, cottages and homesteads. Considering its close proximity to Canberra, the place has managed to maintain a village atmosphere, attracting visitors to its monthly Hall Markets, the various cafes, and even beer, wine and cider tastings at Hops and Vine. Daughters at Hall, the general-store-turned-café, is run by a couple of chicks whose family first settled in the area in the early 1800s. The building has passed its centenary quite a few years ago, but still retains a facade from yesteryear. Huge picture windows light up the large space while tables are set up outside in fine weather. A serving of scones includes just one small scone that’s already dressed with a dollop of cafe-standard strawberry jam topped with thickly whipped cream. The scone isn’t particularly impressive; the tough base and its small size doesn’t lend itself to providing a soft and fluffy scone. Points go to the lovely presentation though. Tea: A small selection of loose-leaf teas served in a small teapot. Overall: A cute historic village not far from Canberra’s action. This quintessential tea house is the ideal location for a High Tea extravaganza. It has all the bells and whistles: a massive tea selection to keep whistles wet for lots of nattering, an elegant dining area with chairs that have the shape of a teapot cut out of the back rest, and it’s a specific function venue for the huge groups. The day I visit, O’Hanlon Place looks windswept and bleak, but perhaps in finer Canberra weather it’s a pretty place for a special event. The venue is certainly large enough for it, but can be kept small and cosy for quieter days. The oven-fresh scones are the best bit of this spread, but that’s if you don’t include the phenomenal choice of teas. The scones do have a sweet aftertaste like they are made from a pre-prepared scone mix, or perhaps there’s too much vanilla in them to my taste? The sweetness is overkill as the cheap quality jam and the synthetic cream from an aerosol can are super sweet. The spread is well-presented, the goods delivered on a serving board with a dollop of berry compote, a strawberry sliver and a sprig of mint. A great presentation and decent scones still can’t rescue what essentially is an expensive and slightly disappointing Devonshire Tea. For $15 or so dollars, I do expect top-notch jam and cream. Tea: The tea selection is out of this world with almost 100 varieties of loose-leaf teas served in a clear teapot kept warm by a tea light. Overall: An elegant tea house for those who take tea seriously. Walk into the Adore tea shop and tea room, and it’s easy to forget where you are. The Mitchell Tearoom has relocated closer to its heart – the loose-leaf tea giants Canberra warehouse. Ignore the tea room’s neighbours; mechanics and other businesses that inhabit light industrial estates, because once through the doors, it’s a world of tea and everything associated with it. Embrace the shelves of 200 plus loose-leaf teas and blends, tea ware, tea candles and tea accessories like infusers and travel mugs. Surrounded by every type of tea and tea combination imaginable, diners can tuck into decadent desserts accompanied by said teas. The tea room is simply furnished but with feminine touches using Christiana fine bone China tea cups. It’s a bit of a wait for my scones, but that gives me some time to savour my tea and surrounds. It’s not the kind of place to pop in quickly for a treat (it’s up there in price), but rather an experience to be savoured and shared with friends. The two scones are served with rose butter and more than enough thickly whipped cream. They are crispy on the outside and soft on the inside, although they probably should have come out of the oven a few minutes earlier. I barely taste a hint of the French Earl Grey in the jam, which I find far too runny and the portion barely sufficient for one scone. Be sure to stock up on Adore Teas before you leave. Open Tuesday to Sunday. Tea: A whopping list of loose-leaf teas to suit every mood and palate. The tea is served with aplomb and the transparent teapot is kept warm with a tea light heater. Overall: A chilled tea room and tea shop located in a light industrial area. There’s always a good reason to visit the National Gallery of Australia. They are forever nabbing the best exhibitions and the gallery houses Australia’s most prized art collection. I’ve just squeezed in a visit to the Toulouse-Lautrec Paris & the Moulin Rouge exhibition and I must say I was more fascinated by the stories accompanying the art than the art itself. Managing to slip in to the NGA Cafe by the skin of my teeth as it closes at 4.30pm, I’m able to nab the last lonesome scone off the shelf. The cafe is light and bright, a nice gathering space to chat about the art. I’m impressed with the thickly whipped and ample cream (considering I only have one scone) but the jam is nothing extraordinary. The scone is really crispy on the outside and I like the thick texture on the inside, they were definitely fresh this morning (as opposed to yesterdays). Try to make it in the morning rather than at 4.29pm, when the scones are straight out of the oven. Tea: Several varieties of T2 tea in fancy teabags served in a small pot. Overall: Bright and open, the perfect place to absorb and rest. Visit the Australian War Memorial late in the day and be sure to stay for the Last Post Ceremony. It kicks off when the Memorial closes at 5pm and begins with the Australian national anthem followed by the piper’s lament. Every day a different name is chosen from the Roll of Honour and their story is shared. The ceremony takes place around the Pool of Reflection, and after a few speeches, wreath laying and the sounding of the Last Post, you’d be one tough cookie not to feel moved. Literally a minute’s walk from the Memorial, the proximity of Poppy’s Cafe is a treat. Not just any old cafe, it’s part museum and part memorial, and feels more or less an extension of the Memorial. When ordering scones, what you’ll get is one well-sized scone that doesn’t look particularly appetising. However, when dissected and dressed, it’s fluffy centre hits the spot. The strawberry jam is rather ordinary but the slightly sweetened chilled whipped cream makes up for it. Tea: A very small range of Tea Drop silk teabags served in a small pot. Overall: Light and bright; it feels like a quirky gallery belonging to the War Memorial. Rodney’s Plants Plus is your typical 21st century garden centre. There is plenty to peruse including a vast selection of plants, flowers and herbs, basically anything green and living for the garden is on offer. Let’s not forget everything needed to help the garden thrive and of course, the cafe. Garden shopping is hunger-inducing work, right? All comings and goings is through the home and giftware store, and good luck in leaving empty-handed! Rodney’s Garden Cafe has indoor, outdoor, and shaded eating areas, and a plethora of nooks and crannies for diners. During inclement weather indoors is recommended, as shade cloth doesn’t hold back the rain. The scones are sensational: delicate, and oh-so-fluffy and feather-light. The miniature jam jar of strawberry jam is cute, but the jam is nothing better than the average jam served in cafes. Additionally, we might like our scones super light, but the cream? It’s a definite no-no. The fresh cream from a cream canister looks tidy, but is way too aerated for the DT Guide. The sprig of fresh mint leaves is a fitting garnish, considering we are at a garden centre. Tea: A small range of Serenitea silk tea bags served in a small teapot. The Tea Lounge in the lobby of the Hyatt Hotel Canberra is an institution for lovers of afternoon tea. I’ve been here many times over the years for weekend High Teas and the occasional Devonshire Tea. On this visit I’m here with a critical eye. As far as five-star hotels are concerned, this heritage hotel is pretty low-key. With a hint of 1920s and doormen that look like they belong on a golf course rather than in a hotel, the Hyatt Canberra is suitable for both business and leisure travellers. If you are staying at the hotel you’ll inevitably end up in the Tea Lounge, which is more open-plan-space than intimate lounge. There are three scones per serve, which is generous, and if you include the mini friand served with the tea, it’s almost a full meal! The blueberry Beerenberg jam in petite jars is better than most generic jams found in cafes, but the pot of firm chilled cream rounds out this spread. Tea: Around 30 choices of loose-leaf teas and tisanes served in a large teapot. Overall: A Canberran afternoon tea institution. Pialligo is a green thumb’s paradise, where garden centres sell all manner of stuff to do with gardens, including garden accessories and giftware. Although, visit Bliss Garden and Giftware and you might be disappointed if after living greenery. Instead, there’s an abundance of accessories to beautify gardens such as garden pots and furniture, water features, and home and giftware. Sharing the same plot of land is Tulips Cafe, which has a seating arrangement to suit all plus a large kids playground to keep the young and restless occupied. A tad unusual but there’s a peacock wandering around the garden furniture, although I’m not sure where he belongs. I choose one of the large plain scones, leaving the date scone for another day. It’s on the dry side, but it is closing time after all. 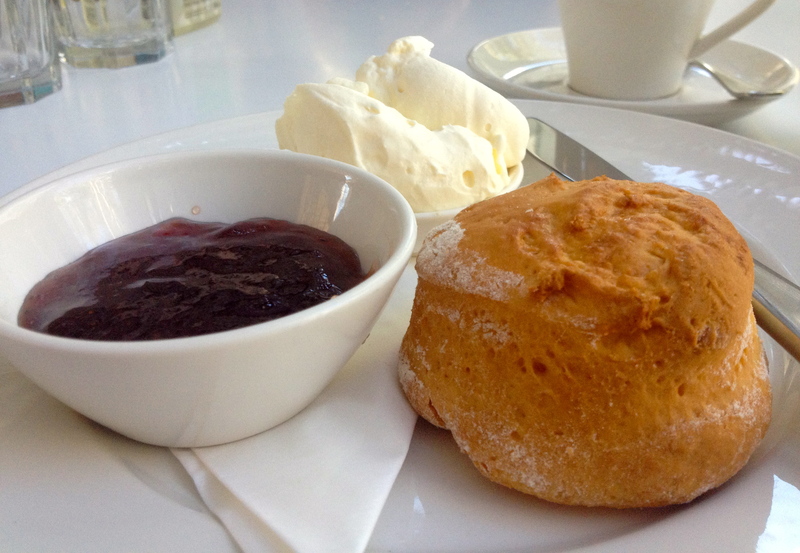 For the size of the scone there’s not enough jam, but that’s no great loss as it’s mediocre. The cream on the other hand is double thick rich and goes the distance. Impressive is the contemporary fine bone China cup and saucer by Pearl, which makes sipping quality tea a pleasure. Don’t leave your visit too late as the cafe staff have one foot out the door before 3pm. Tea: A small range of Adore loose-leaf teas served in a good-sized pot. Overall: Half garden accessory and gift shop, and half cafe.